Thanks, Dawn! This is too important for people to sit it out. Wonderful! I linked into this blog at the tail end of your comments on SR. What a beam of light shining through all the dark vitriol! Thank you, Anonymous Chris! Come say hi if we're ever at the same meeting or rally or something. Is this a pro-levy only pg or do you welcome open discussion, cordial interaction, and possible disagreement? If allowed, here are a few comments. Even with levy season ending, I still welcome a discussion on any of the points you may disagree with. 1) Contrary to the apparent beliefs of most levy supporters that people in opposition are sinister child haters, there are many anti-levy citizens with no ulterior motives. I, for one, simply appreciate having actual truths presented (rather than fear invoking commentary and distortions I've read/heard). Making it appear that 3yrs of levy costs will be paid in a single yr is an example of distortion on the anti-levy side. Similarly, there are many examples of distortions & less than true statements from the pro-levy side (I'll address a few throughout). 2) I'm certain that "at least" 95% of levies will pass so this issue will simply stagnate for another few yrs until the next special(ugh) election. Given such certainty, especially in the districts with the historically strongest levy support rates (and given the lowered simple maj requirement), wouldn't the money spent by levy supporters have been better used as simple donations to their respective schools? *Blogspot sometimes has formatting errors with pasted items (like " ", ', and a few others). I corrected the ones I noticed. 4) Levies are meant to be one time fill-gap revenue streams that may be necessary once every 10-20 yrs. They're "NOT" meant to be a "constant" revenue stream... It shows incredibly bad district leadership when districts have gotten to the point of expecting levies as a never ending portion (1/4) of their budgets. Anything with an expected END date (like a "3yr" levy tax or a mortgage) has to have a "new" one started in order to "remain" in place so it's perfectly accurate to say it's a new tax. What if, after paying off your mortgage, the bank said "we don't want you to pay a new mortgage, we'd just like you to pay on this replacement mortgage" for another mortgage term...? How would that go over? If we paid levy taxes on a monthly basis, and there was a 1 month break between the old and new levy (meaning the tax would be gone for 1 month), would you agree that the new levy is a new tax? In other words, would you have to actually "See" at least 1 month of taxes "without" the levy to agree that the new levy is a new tax? Exactly what would be the difference between that scenario and having no 1 month gap (aside from the 1 month tax savings) in regard to it being a new levy? Just because these new levies take over with no break, as opposed to the 1 month break in the example, doesn't change the fact that they're a new levy/tax (it just makes it "less noticeable" than if there was a break period). 5) Irt "Gosh, I guess the Washington State Supreme Court missed the memo"
6) Throwing around a bunch of belittling comments like "they slept through math and reading class" never helps an argument. You must realize this, correct? --- Why? The "exact" items cut are determined by "the districts" not the levy. Therefore, they could "choose" to cut anywhere they want (like from the other 8 buckets or the cable & phone items of the following examples). There's nothing that forces them to cut any specific program. You seem to be a bit confused irt how accounting works so allow me to provide an example. Imagine an $8M budget spread into 10 buckets. If some of the costs were allowed to grow unchecked in buckets 1-8, the easy "fix" would be to simply use the funds from buckets 9&10 to back-fill 1-8. Then a levy could be run saying "we need $ and it's only for buckets 9&10 (M&O, technology, or whatever the specific levy indicates). The "net result" of the additional $2M would simply be that the new "overall budget" is $10M instead of the original $8M. The shell game here is that they could just as easily have said the $2M is for buckets 1&2, 3&5, 4&7 etc. In other words, the "exact" place they "choose" to say the $ goes to is absolutely irrelevant because it´s all part of "one overall budget" that is being spent. Even if they specifically wrote a $2M check to buckets 9&10 (still representing the levy per the example) it wouldn't change the fact that the "overall budget" has simply increased by $2M (to $10M). That $2M is doing nothing more than allow money that would've been paying for buckets 9&10 to be used for other items in 1-8. It's like taking money from a household's food budget and using it for cable & phone then saying I need more food money (levy) and if we don't get it we'll starve (arts, STEM, teachers, etc. will be cut). 8) Keeping schools strong isn't being argued (everyone wants that). Many people believe funding is already sufficient (especially if the underfunded budget items and overpaid administrator pay issues were addressed). Does anyone think if SPS's advertised various administrator jobs for 70-100K that we wouldn't get a lot of highly qualified candidates??? I'd put money down that we'd get "many" replies from applicants with very good credentials... Btw, a military LtCol makes ~$100K and has much more on his/her plate. Many (no, not all) private schools currently operate for less money while achieving better scholastic success rates. Their methods, policies, and cost structures should be examined to locate areas that can be emulated. Unfunded liabilities need addressing as well. Yikes, this must be a novel with all these character limit maximums I'm getting...I wonder if you're still reading it or not? 9) I'm "completely for education" funding via a fair and equitable method. A much more equitable method of requesting additional funding would be to request it via a sales tax (whatever fraction of a penny required). That way, "everyone" casting a vote would be voting to not only increase other people's taxes, but "their own taxes" as well. Aside from that, if it's going to be a "property tax" then either A) only property owners without exemptions should have the levy on their ballots or B) it should be a supermajority vote. Right now many people vote who don't even pay property taxes... Otherwise, this type of levy tax should require a supermajority in order to be considered more of a fair vote (explained below). I decided to post the explanation in its own comment instead of stating it here (so as to avoid a broken up explanation). A supermajority vote is necessary anytime you allow a subset group of people to vote on a matter that's beneficial to them but that they're "not" directly impacted by (in a financially impacting way, i.e. they don't pay for it). 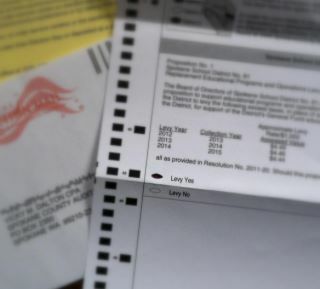 For example: Using 100 voters (50 non-levy payers & 50 levy payers) we see that if 65% of "NON-levy payers" vote "YES" (.65x50=32.5), a levy like this could pass with ONLY 35% (.35x50=17.5) of the actual levy "payers" voting for it. Does passing a tax on people, when only 35% of them voted for it, seriously seem fair/democratic to you? By no means was that an "extreme" example. It could easily be worse than that because voting rates of 75% (.75x50=37.5) are quite possible among people who benefit but don't have to pay the tax (especially with all the exploitative "for the kids" ads). In that case, a meager approval rate of 25% (.25x50=12.5) would still PASS the tax. Even if you somehow justified thinking the 35% approval rate was good enough to pass a tax on people, what do you think about this 25% (75% against)rate? Is that fair? Even though it's not a certainty that non-levy payers would would vote at a rate of 75%, the simple fact that it's realistically possible to happen makes it a flawed system correct? Again, it's basic mathematics that shows why a supermajority vote is required in order to simply even out the vote and account for the addition of a group of voters who don't have to pay for the very thing they're voting for. How about this: If Washington was having a vote to increase the sales tax by 2% you wouldn't want people from just across the Idaho/Oregon borders allowed to vote on it. If they were, you'd want a "supermajority vote" because, as stated above, you'd be adding a subset of voters who wouldn't pay the extra tax but would benefit nonetheless (as people crossed the border to avoid the 2% increase). Wouldn't you be a little upset if that 2% tax passed with only 35% support of actual WA state voters? What if it passed with only 25%? Would you still think that was "democratic"...? Remember, it's just the fact that it's possible that makes it flawed and these aren't even unrealistic figures. Here's why 60% is an appropriate level to attain for a supermajority vote. Using same 100 people example: 1st you account for wanting at least a 50% approval rate among the actual "levy payers" (.5x50=25). Now you make an educated estimate of the "non-levy payers" yes voting rate. Again, a higher yes rate is very typical when people vote for something they benefit from but don't pay for. Assuming a 70% rate (between the 65% & 75% examples) we get (.70x50=35). Adding the two group totals yields 25+35=60% which is the customary supermajority figure used. *If a levy passes by 60% then there's a good chance it would've also passed with a simple majority vote consisting of only property owners so those are decent results. However, any that pass with less are mathematically flawed results (from a fairness issue). A state sales tax with total revenue evenly distributed is still the best (most fair) solution. The argument that "renters pay levy taxes via rent" is "ridiculously simplistic" because only in a perfectly linked system would this be the case. In actuality, landlords can only charge what the market will bear. Meaning, if a landlord can't get a renter at a price that covers the costs of the levy, he/she has to lower the rent in order "to simply rent the unit out and avoid a vacancy". I look forward to your reply...err, replies? This is not a "pro-levy only" page. It is my personal blog, and I am pro-levy. I generally don't delete comments that disagree with my views; if I feared disagreement I shouldn't be writing a blog. However, I'm not going to respond to each and every point raised here. Had you posted one or two thoughts so I could respond to those the dialogue would make some sense. While I appreciate the time you took to respond, I'm getting over the flu right now and frankly don't want to keep scrolling up and down to read the novel and write a response to each point. I don't think anyone else who might run across this page is going to want to do so either. It's the problem of a very linear format for a multi-faceted topic. It might have been simpler just to note that you had blogged on this yourself and linked to your own blog, with relevant bullet points highlighted here. I recognize your comments as ones I read elsewhere, either on the Spokesman-Review site or perhaps the Yes for Kids Facebook page, and I think I may have responded to some extent there as well. I'm not the least bit confused about the accounting. School district funding comes from a variety of sources, many of them with very specific funding constraints (mandates). The district can't move federal dollars over to pay for a different program than, say, Title I reading or special education (which is a consistently UNfunded federal mandate--talk to the federal delegation about this, please). Much the same is true for state dollars that fund direct instruction or anything else they direct funds to. The sequence of state budget allocations, federal reappropriation, levy elections (which are only permitted at certain elections under state law), and renewal of contracts simply does not align in a logical way that enables all the variables to be fully specified. This is not the district's choice. So the levy--as a fungible funding source--has to be what fills in the gaps. Saying it wasn't meant to be what it has become doesn't eliminate the need for the funding. We can blame the state, we can blame the feds, but each class of kids who graduate without the resources the levy supports will only blame us, because we're the ones who held the answer directly in our hands. That's local control. If we want to turn over all funding responsibility then we have to turn over all decision-making authority, and no one who opposes the levy ever seems to be calling for more state or federal control of curriculum or outcomes. I lived in a state with a supermajority requirement for both operating and construction levies--Idaho--and moved back to Washington for a reason. A supermajority requirement gives no votes a disproportionate power in the outcome--every no essentially has to be offset by two yes votes. No member of Congress would want to be elected under such a system. The Idaho schools were double-shifting, classrooms were overcrowded, and despite the best efforts of wonderful educators the system couldn't provide what my children benefited from here. Anyplace that systematically underfunds its educational system is at a global disadvantage. Businesses looking to relocate ask first about the quality of local schools and their support because they know it affects their workforce and what will happen to the children of their leadership. I don't want us to lose in those comparisons. In Idaho we used to say, mournfully, "Thank heavens for Louisiana" (or Mississippi, depending on the latest rankings) because that was what kept us from being dead last in funding per pupil--admittedly a rough input measure but one that does hold up when outcomes are evaluated. Hi Barb, I hope you're feeling better now. Off topic, but you seem to have a pretty well set up blog pg (not that I'm an expert on judging that). I actually posted on another of your topics so at least that should help your pg view #'s (me clicking around to get to it). Although I don't routinely do a ton of blogging myself, I did register for one a few yrs ago but never really stayed with it because it seemed too much like simply writing in a diary (unless you get a big following) and I prefer a discussion. However, I have seen more and more sites where it's possible to associate a blog with a person's log in ID and realize it's possible to leave a link in various internet postings (like your link to my l-o-n-g post on facebook yes for kids) so perhaps I'll put some time into it again in the future and see if I get some discussions going..
Btw, thanks back at you for also taking the time to read (or at least skim) my novel :). I couldn't agree more with your comment: "a very linear format for a multi-faceted topic." I try to fully answer all points brought up in a post that I'm replying to so the more points raised (like in your 1st post on this blog pg) the longer my reply becomes. For example, I basically went from top to bottom in you're post and each of my replies start adding up until they reach "novel" level. I look at any topic from both perspectives as I'm thinking/writing which causes me to write my replies while anticipating the other person's responses/questions and attempting to answering them "before they bring them up" which prevents them from having to ask them). I also tend to want to cover as many angles of a topic as possible, which you can see in my 1-10. In the long run it should cut down on the sheer # of posts, therefore preventing a thread from getting so long that you have to search through 50+ replies to locate what you remember someone saying 4-5 days prior. Btw, if you're still sick, you might try a little herbal tee (with honey) throughout the day. That's what I make for my wife when she's sick. Hydrate, hydrate, hydrate. Once you feel recovered, feel free to reply to this and any of the prior points you get the time to read.